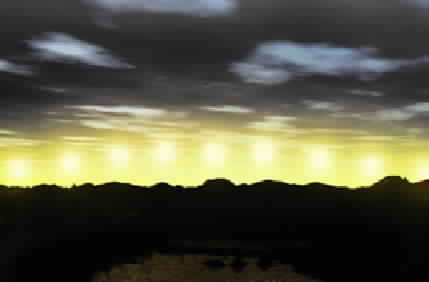 Time lapse photography shows the sun's apparent travel around the horizon near the north pole. Since (1) the sun's apparent travel over the earth's surface is at the rate of 15� of longitude per hour regardless of latitude, and (2) the sun circles the horizon during periods of total light in high latitudes, the sun can be used as a compass provided correct time is known. 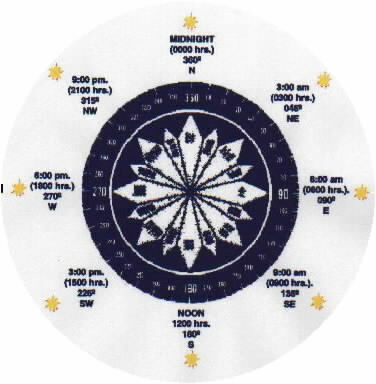 As an aid, the sun is at its highest at local noon and its lowest at local midnight. This is true everywhere except at the north pole where the the sun circles more or less equidistant from the natural horizon.